I’ve just attended the launch of Boris Johnson’s election posters. There’s 9 executions each making a different policy pledge. 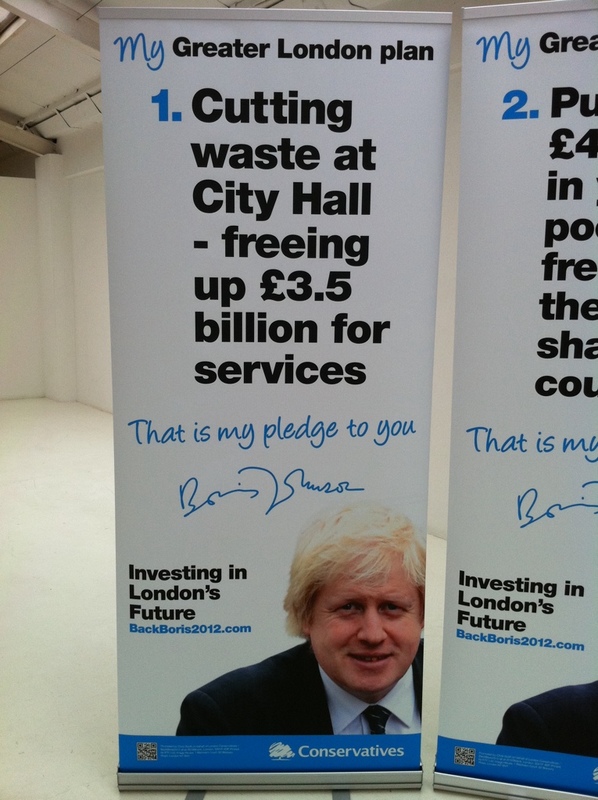 After David Cameron’s airbrush-gate, Boris’ team have cruelly decided not to retouch his image at all. No agency has been used, Johnson’s in-house team have written and laid them out. They’ve disobeyed the outdoor advertising unwritten rule of ‘never use more than 8 words’ and spelt out exactly what they want to say. As a result, there’s no jokes, no wordplay and no real creative idea. More analysis and images to follow. Dem posters in 2005, putting CK front and centre, with a very strong message, but not as good. They are just too busy- the main message is lost amongst the superfluous words around it. People like Boris. All you need is his image and the statement. Why all the faux handwriting and pledge language? It shows that this was done in house. D Ritterband (head of BJ marketing) may be ex- Saatchi, but brutal simplicity this is not. Completely agree. There’s so much going on in these the viewer ends up taking away nothing at all.